We Buy, Sell and are a Supplier of Portable Hot Oil Heaters and Temperature Control Units. 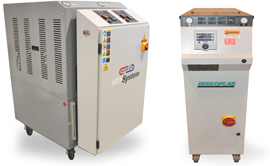 We are a dealer specializing in used portable thermolator hot oil temperature control units; we regularly stock heat transfer units in single zone and dual zone configurations. Hot oil package boiler temperature control units are commonly used in injection molded plastics, extruded plastics, extrusion, blow molding, plastic film, foundry and die casting applications for preheating and maintaining tooling temperatures. They are also used in process industries including food processing, petrochemical, petroleum and pharmaceutical industries. Receive email alerts when new inventory matching Hot Oil Units become available? Recently Sold Listings in the Hot Oil Units category. Major manufacturers include: Advantage, AEC, Budzar Industries, Chromalox, Colortronic, Conair, Delta T Systems, Frigel, Heat Exchange and Transafer, Industrial Frigo, Mokon, QPC, Regloplas, Robamat, Shini USA, Temperiertechnik, Sterlco, TempTek, Thermal Care, Tool-Temp, and Tricool. View more pictures of major manufacturers: Mokon, Sterlco, Advantage, Regloplas, Conair, AEC, Thermal Care, Budzar Industries, Chromalox, Colortronic, Delta T Systems, Frigel, Industrial Frigo, QPC, Robamat, Heat Exchange and Transfer, Shini USA, Temperiertechnik, TempTek, Tool-Temp, and Tricool. View all Hot Oil Temperature Control Units.